Recognition for women in the fields of art and culture is important to AWA. Our Honors Program in Florence is for women who continue to 'break the mold'. Honoring the Contributions of Modern-Day Women in the Arts. 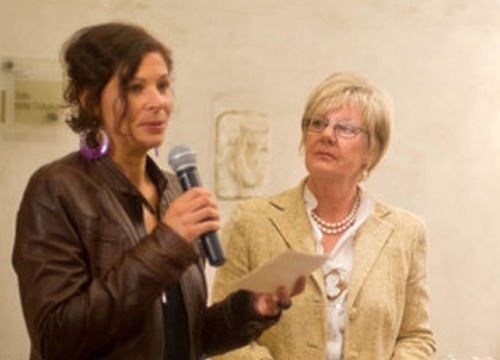 Advancing Women Artists supports an on-going awards program honoring women museum directors in Florence, women restorers, patronesses of the arts and contemporary artists for their outstanding contributions to the culture of Florence. These awards, recommended by previous awardees, give recognition to deserving women in the arts who enhance the fabric of the community. Our Nelli Award takes its name from the first known woman painter in Florence, Plautilla Nelli. It periodically recognizes noteworthy contributions of the city’s 30+ women museum directors in Florence. The Outstanding Conservator Award honors a local woman restorer. The Anna Maria Luisa de’ Medici Award, named for the last Medici heiress, recognizes a patroness of the arts. The Simonetta Vespucci Award honors contemporary female Italian artists. Called "the unparalleled one", historians remember Simonetta Vespucci as one of the loveliest women of the Renaissance, the personification of Botticelli’s idea of ideal beauty. Have a look at our many deserving awardees here. 2006 Anna Maria Luisa de’ Medici Awardee. 2004 Anna Maria Luisa de’ Medici Awardee.